For the foreseeable future, Charlotte will continue to be home to the annual CIAA Tournament. Below is the excerpt of a press release I received via email at 3:10 p.m. today, corresponding with the 3 p.m. CIAA press conference held at Charlotte Convention Center. 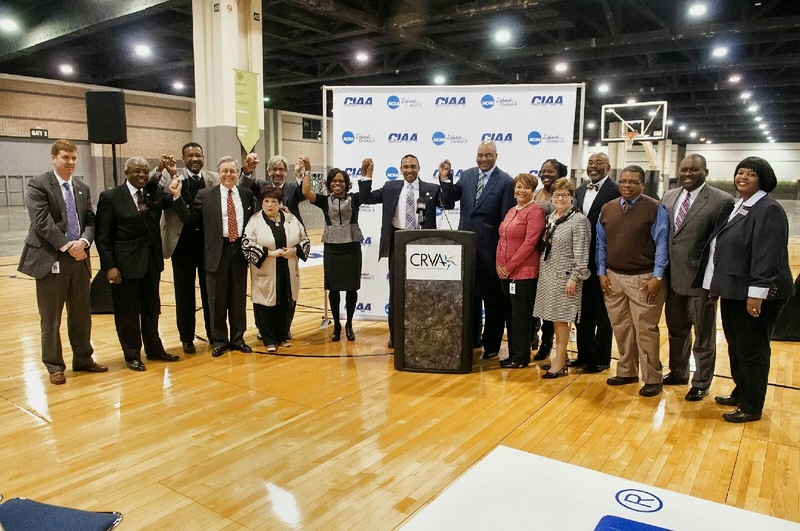 CIAA and Charlotte stakeholders rejoice during today's announcement. CHARLOTTE, N.C. (March 3, 2014) – The Central Intercollegiate Athletic Association (CIAA) and the City of Charlotte have agreed to exclusively negotiate a broadened partnership to include the Men’s and Women’s Basketball Tournament in Charlotte, N.C. The decision comes on the heels of the 69th Annual Men’s Tournament and 40th Annual Women’s Tournament, which was held Feb. 25 – March 1, 2014 and was the ninth subsequent year the event has been held in the Queen City. The new agreement would commit the tournaments to be held in Charlotte for at least the next six years beginning in 2015. In turn, the City of Charlotte, Mecklenburg County and Charlotte Regional Visitors Authority (CRVA) will provide various benefits, including $1.4 million in funding annually, proceeds from which will be distributed among the 12 conference colleges and universities. In addition, the CIAA will move its conference headquarters to Charlotte in the near future, with specific timing and location to be determined. The relocation will enable the conference, the CRVA and other Charlotte entities to more effectively partner in the community, providing increased visibility for the CIAA and helping to secure enhanced sponsorships benefitting the 12 member-institutions. Last year, the tournament generated a substantial economic impact for the region with $29.86 million in direct spending and $47.17 million in economic impact. The study was conducted by the CRVA based on widely used best practices from leading economists and the hospitality and tourism industry. A 2014 study will begin soon and will be released upon completion. Touted as the third most attended basketball tournament among all NCAA divisions, the CIAA Tournament has become an integral event that the Charlotte community rallies around year after year. Most importantly, it has fostered an important legacy for the future through the funding it has provided in scholarships for the 12 member institutions, enabling students to attend CIAA schools. CIAA has consistently ranked as one of Charlotte’s largest events, only second behind the 2012 Democratic National Convention to date. Well, this puts an end to the rampant speculation and curiosity as to where the 2015 CIAA Tournament (and the hundreds of parties that surround it) will be held (sorry, Atlanta). You can relive my coverage of 2014 CIAA Week by visiting CharlotteMagazine.com/CIAA.